JRPG house Atlus is looking to enter the HD era at last, with job listings suggesting that the development studio is seeking programmers who have experience with the PlayStation 3 and Xbox 360. While Atlus has published several games for the current generation of videogame consoles (such as Demon's Souls), its internal development studio has been remarkably quiet when facing the prospect of jumping onto the Hi-Def bandwagon. "Nah," the company seems to say, "we're cool staying on the PS2 for now. You guys go on; we'll catch up later." That "later" might actually be sooner than expected. Siliconera has unearthed some Japanese job listings that suggest the JRPG studio known for its bizarre(ly appealing) Shin Megami Tensei series is looking for a programmer who has experience working on the PS3 and the 360. According to the ad, qualified applicants must be interested in game development (er, that seems like a no-brainer) and must have worked on a previous PS3/360 RPG. So ironically, Atlus' own internal developers wouldn't necessarily qualify. I guess this is why the company is looking for someone else. 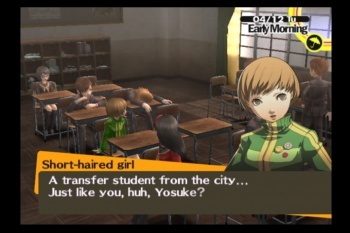 The most obvious conclusion-to-be-jumped-to is a possible Persona 5, which was reported to be in development for the PS3 by a Pachinko report (of all things) back in July. Further supporting the Persona 5 theory was a listing on Atlus house composer Shoji Meguro's profile that credited him with Persona 3, Persona 4, and Persona 5. Of course, it could also be something totally out of left field. Smart money says P5, but Atlus could always surprise us.